I sure wish I had taken the time to come up with these 10 Tips to Keep Your Thanksgiving Organized and Stress-Free for my first years hosting Thanksgiving! Thanksgiving is meant to be a time of being thankful and enjoying the company of family and friends – not a day of stress and pulling your hair out! However, if you’re in charge of cooking for the big day, you probably identify more with stress than relaxation. 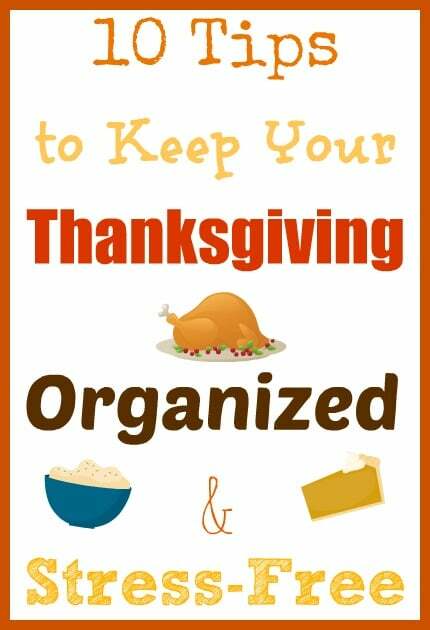 Luckily with these handy tips to keep your Thanksgiving organized and stress-free, you can enjoy the true meaning of the holiday with loved ones without giving it a second thought! Create a list of the recipes you want to use. I also sort the recipes by what I can make or prep ahead and total cooking time to try to have everything ready to serve at the same time. 2. Shop Early and Purchase Extra – This is likely a no-brainer for everyone, but it can be easy to forget with a full plate and when the holiday sneaks up on you before you expect it. I always make sure to shop a few days before Thanksgiving to get everything I need and buy just a bit more than I think I will need. For example, buying a couple extra cans of green beans in case I scorch the first batch while taking care of everything else (or just run out) as most stores are closed or close early on Thanksgiving. Plus, this lets you beat the mad rush of people shopping at the last minute and also ensures what you need won’t be out of stock. Turkey deals are usually the best the week before or of Thanksgiving, but many other items you may use are at the same sale price a couple weeks before. 3. Pull Out and Sort Ingredients You’ll Be Using – Nothing puts me behind more on Thanksgiving than searching for ingredients I rarely use, so I like to take a few minutes and pull out all the ingredients before I start cooking. For refrigerated items, I dedicate a shelf or 2 instead of having things hidden in the back of various shelves or drawers. I leave spices and dry goods out on a spare table or counter top so everything is in one place and I don’t have to run around the kitchen and pantry like a chicken with its head cut off. ;) This is also a great time to make sure all your spices, etc. are still good instead of finding out at the last minute you need fresh items. 4. Bring Out Your Serving Dishes the Night Before – This may sound odd, but I actually find that pulling out the serving dishes the night before and sorting them actually makes Thanksgiving less stressful. I’ve totally wasted precious time in the past searching for a dish that I could have sworn was in a certain cabinet or using a dish that was meant for a side for prep and scrambling to find another, etc. 5. Do As Much Prep-work as You Can the Day(s) Before – Many dishes can be made the day or two before the big day like side dishes, breads, pies and other desserts. All you have to do is reheat for a few minutes before the rest of the meal is ready, if needed. Others can be pre-made up to the point of cooking, like stuffing. You can also chop up all your veggies and put them into a container in the fridge (like for stuffing or salads). 6. Set the Table the Day Before – Unless you have small kids or pets that may disturb the table, or have the luxury of awesome guests that arrive early to help out, setting the table the day before can be a huge time saver. This is also a great way to make sure you have enough dishes, silverware, etc. for the amount of guests you have. It’s easy to forget that little Timmy accidentally broke a plate or glass last Christmas! 7. Get Your House Ready a Few Days Early – Tidy up your house a bit, if needed. Perhaps buy some scented candles to help everyone be in the holiday mood. Have any decorations put out or ordered. Order any trays you may need for appetizers while cooking. Be sure you have plenty of clean linens and dishes for the day, as well as tables and chairs. 9. Have a Clean Up Plan – If you’re nice enough to give your guests leftovers to take home, be sure to have some foil containers, disposable plates or cheap plastic-ware for them to use. Have the dishwasher going with your prep dishes as you continue cooking so plates and platters from your meal can go straight in instead of sitting and becoming tougher to clean. 10. Don’t Be Afraid to Ask for Help – Last, but certainly not the least, never feel like you have to do it all yourself, especially if it’s your first year for hosting. Ask a couple friends or family members to come over and help you cook. Odds are they’ll love to help and you’ll all love the memories you create together for years. Request that guests bring a dish or beverage – this is especially helpful if your family has a number of allergies. I do like to delegate what my guests will bring as other wise you may have multiples of a dish or too much wine (is that possible?) but not enough dessert. Let guests actually help clean up when they ask, etc. 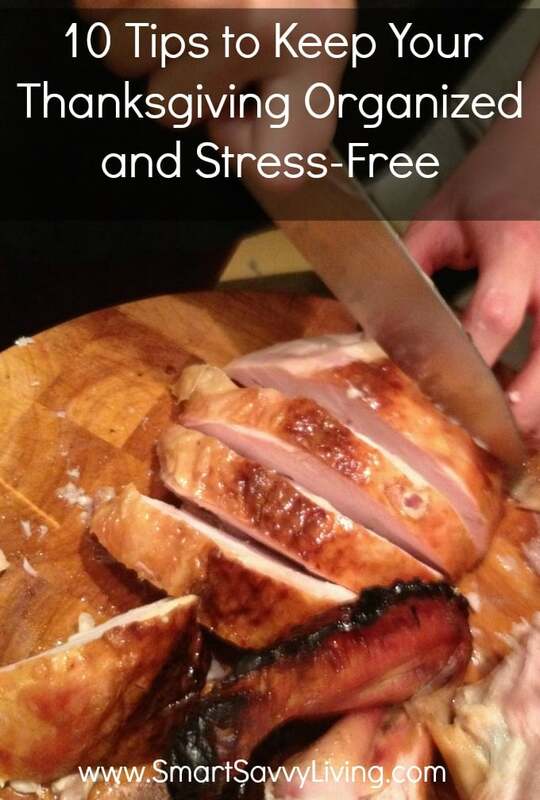 What are some of your tips for an organized and stress-free Thanksgiving? these are great tips fora smoother holiday get together. Thanks for sharing. These are all VERY helpful tips to keep the stress down. Planning is key! great tips I’ll need! thanks for helping get me organized early.